Twenty Three years ago today was a Monday. That meant Family Home Evening at the Dunes. I went to my Dr. appt. at 2pm and headed out to the dunes with the family in tow. We hadn't been there very long and I began to cramp. I didn't say anything, just started timing them. By 6 I told Tom we had better get going, I was pretty sure I was in labor. We left the boys with the Marchants and hooked up our trailer and headed on in. We hadn't gone far when our truck quit working properly and we were pretty much moving along at about 2 miles an hour. We dropped the trailer at the inspection station and kept on limping in. The pains were about 2 lminutes apart and I just knew we were going to have to name this baby "Freeway". To make a short story shorter, we made it to the hospital and had the biggest surprise of our lives. We got a baby GIRL!!!!! WoW! She has been a light in our lives every since. 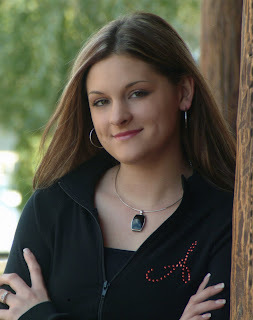 So Happy Birthday to Ashley Nichole Lemmon Coulter. We love you! 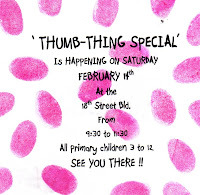 Well, Valentine's Day came and went and with it, the Primary Activity that was Thumb-thing Special! I think it was successful and I hope the children remember a little of what was taught. We had a round of 4 classes all geared toward making our family strong. Then we gathered at the end and had a little object lesson on how the family is like a rope. The kids all seemed to get it and liken what they had learned from the classes. There favorite part of course was the Tug Of War we ended with. Oh and the cupcakes!! Thanks to all of our presidency and Lynna for teaching the classes. I felt like we had a great time, good turn out, especially considering it was a holiday weekend. I didn't of course, take any pictures which was so like me! So now I am on to the next project, Young Women's Camp. I finished "Celebration" again and wanted to let the author know how much her book has meant to me so I did a search for her online and found out she passed away last year. I am sad. She was so wise and I wanted to tell her. I love so many of the things she says I wish I could remember them. But for today I will post one of my favorite. "The gift of daily celebration is bound up in our ability to see the hand of the Lord, the Creator, in all things-to see beauty in every manifestation of creation, in the talents of others as they are inspired by God, and in others themselves, because they too,are creations of the Lord." I hope you all have a day of Celebration today! I am amazed that time can pass by me without so much as a breeze to tickle my mind. January is a blur. Actually, most days are. It's what happens when the mind goes! I spent a few days ill for a few weeks of last month but this one is better. I made it to the gym for 5 days in a row last week! Hallelujah!! I have been reading quite a bit. Finished Edgar Sawtelle, loved it. Although it did take me a little bit to get into it. Someone at the gym was talking about it and I said I just couldn't get into it and they asked me where I was. I told them and they said I hadn't gotten to the good part yet. So I went home and read another 20 pages and there it was!! I was hooked. Had to sit and finish the whole thing that night! Then I took a trip with The Secret Life of CeeCee Wilkes. Good read! Finished Firefly Lane on Sat. night. Started it Sat. morning, stopped long enough to take 7 of the grandkiddies to the movies, and then picked it up and didn't put it down until it was finished. I loved it. Great Read! In between I read the 3 volumes of The Kingdom and The Crown series by Gerald Lund. I had read them before but felt like reading them again. And I am glad I did. Made me go back and start rereading the New Testament. Then last night I started another reread, the book called Celebration. I read it every few years and then in the back of the book I write a thought or two. The first time I read it was in '96, then in 2001 and the last time was in 2003. That's one good thing about not being able to remember, you can keep reading your favorites and they are all new again. When I am in the rest home, I'll get to meet new people every day, again and again!!! Anyway, this book is so inspiring to me. I always want to do and be better when I finish it. The last time I read it, I recorded this thought. "I always come away with hope and desire to "celebrate" life more fully, better,and more consistently." I always try to remember the adage, "Celebration is self-made" But I do forget so it is always good to sit with this old friend in print and remember again! Well, that pretty much sums up my sitting down time for the last few weeks. I probably read more in January than I do any other month. Down time from all the hub-bub of the holidays I guess. I am now gearing up for YW camp this summer. We have it mostly planned and just need to get the info to the wards and make it all happen. Saturday is our Primary Activity, then in March and April I have camp activities with the Stake. So that should keep me busy. In between I get to love on my little girls and boys. We went to see Hotel For Dogs last Sat. I have to say it was delightful and I clapped at the end. Much better experience than I had anticipated. It held all of the children's attention and I think they liked it as much as I did. I took Grama Peggy shopping last week and had a heck of a time getting clothes to fit her. They didn't have skeletal sizes. We finally did find a couple of size 2's that fit ok if she puts a belt on! Ah, old age, ain't it grand. We did have some laughs so it was a fun day. Well, this post is long and pretty boring since I didn't even have a picture to spice it up. But then, Journals can be laborious for the reader at times, I'm sure. Maybe if I didn't wait so long in between times.